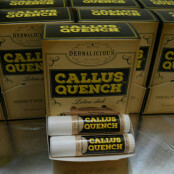 Callus Quench Lotion by Dermalicious is one of the most inexpensive yet effective workout accessories available. Almost every athlete has experience dry, cracked and torn calluses. These are usually caused by lifting heavy weights, pull ups, kettle-bells or any number of other hand trashing movements at the gym. 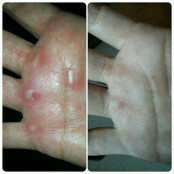 These torn calluses can cause athletes to miss workout days waiting for dry cracked hands to heal. Callus Quench Lotion is the answer, proven to heal cracked hands quicker and get you back to the gym and working out your best. Callus Quench Lotion is made with all natural and organic ingredients. 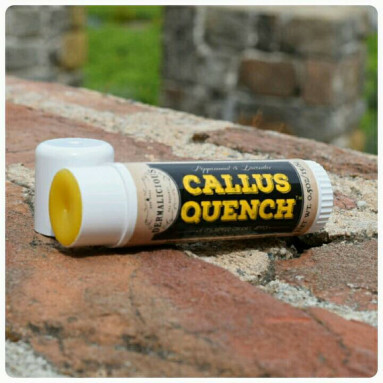 Apply Callus Quench Lotion daily to your dry cracked hands, lips, knees or any other part of your body that needs extra moisture or protection. 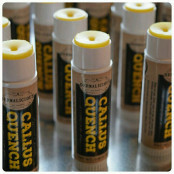 Callus Quench is adored by the athletic world, but is such a versatile product anyone can benefit from using it. Callus Quench lotion is available in two quantities, a single tube, or in a box of 12 for friends, or if you own or run a box or gym. Remember with Callus Quench lotion, if its dry, reapply!! 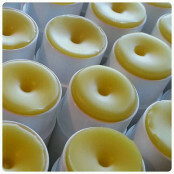 Be the first to review “Callus Quench Lotion Stick” Click here to cancel reply.